FN: Hi Liz, great to see again! It’s been a few years since we have caught up; let me know what have you been doing with yourself? Last time we had a really good chat you were just coming off an injury and still involved in some national level middle distance running. LD: It has been definitely far too long! I am currently working as a registered nurse at St Vincents Hospital, and juggling my new sporting adventure racing the NRS (National Road Series) domestically for the women’s team Specialized Securitor. FN: About 3 years ago you had finally had enough of the constant injuries you were having while running, can you talk us through those injuries you had, why you believed you had them and what enticed you to take up cycling? LD: I fractured my right navicular in 2008 and had a non invasive rehab, I returned to racing at a national level and then fractured it again at the end of 2009, and I had surgery fixating the bone. I’m no podiatrist like you, but I feel this recurring injury was related to the poor blood supply of the bone in healing from the first fracture, I also have since discovered that I have limited flexion within my ankle, and also have extremely tight achilles and calve muscles that affect the natural shock absorption through my foot. When returning from surgery I tore my plantar fascia racing, that progressed into plantar fasciitis and ended up having a plantar fascia release resulting in further time rehabbing. I this injury was related to offloading from the right foot. FN: Have you had any major injuries or concerns since taking up cycling as your sport of choice? LD: I have recently discovered since beginning strength and conditioning training, that my previous injuries are still causing some problem, so I am currently working to strengthen through the arch of the left foot, and also trying to improve the flexion within my right ankle and to stop subconsciously guarding my right foot from putting weight through the arch as I tend to pronate outwards. I have since discovered that these pre-existing injuries have altered certain parts of my pedal stroke and positioning. 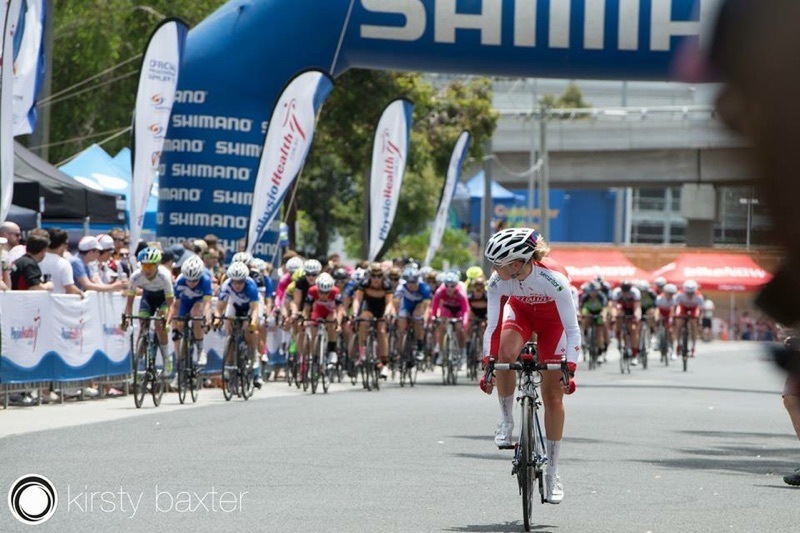 FN: What does a typical day in the life of an aspiring professional female cyclist look like? Do you have time for work and play these days? LD: Unfortunately there isn’t as much funding within the female scene of cycling, so riders don’t get a salary as such meaning that we need to balance working, training and racing. I am very lucky that my team is so supportive with fantastic sponsors that provide us with the best equipment, clothing, vehicles, travel and race supports having a team DS and mechanic provided by Specialized Securitor. I am very lucky that I have a supportive fiancé that supports my hours training, need for sleep, travel, and need to work. We both enjoy when I have a break from cycling and live it up, but focus during racing/training periods. FN: What kind of bike set up do you have? Can you walk us through the specifics and how many bikes currently occupy the garage at home? LD: My team bike is an S-Works Amira, which is a female specific bike. It is a carbon frame, has dura-ace electronic gearing. I race on carbon roval wheels. The total set-up weighs in just on 7kg. Ummm… we have too many bikes at home! Between us we have 10 bikes, all for different purposes… Not all mine! I promise. FN: Do you currently use any insoles, wedging or off-loading devices in your shoes? LD: I currently wear “high arch” supports that are made by ‘Specialized’. But I am researching into personalised orthotics due to my injury history, as I feel this could make a different to my pedal stroke and efficiency. FN: What, if any, cross training activities do you take part in? LD: As previously mentioned I’ve just started strength and conditioning training to try and get on top of weaknesses. You don’t realise what you need to work on until you look! FN: Do you have any major racing events coming up? LD: I have two NRS races coming up soon, firstly the “Tour of Adelaide” on the weekend after Easter, and then I have “Mersey Valley Tour” which is in Tasmania early May. Otherwise I’m just following the local criterium circuit, and will be looking at cyclocross races over winter for something different. FN: Cycling in Melbourne has come under the spot light in the last couple of months with Australian cities being declared as one of the worst places to ride a bike. What is your general experience with motorists? Do you believe there is a misunderstanding of the law from both sides, impatience or a structural issue which is presenting these issues? LD: I had personally been hoping that the 1m passing law would be carried through. As I feel that it is important for motorists to provide cyclists with adequate space for safety. I do feel that both parties have responsibility in managing the current situation, and there needs to be mutual respect. Places like New Zealand have a law for a passing distance for cyclists and it is amazing to ride there, you feel very safe. I do feel that impatience is an issue from both parties. FN: What comes next in the life of Elizabeth Doueal? What are your goals? Where do you see yourself in the next couple of years? LD: Long term I am pursuing the opportunity to race in Europe, I would love to race for the national team in the green and gold, and to achieve the best from myself that I can. I will continue to race the NRS, learn from my team and teammates, aim to win some races and enjoy the cycling adventure. Otherwise I am recently engaged so have a wedding to plan, and am furthering my nursing education and experience to find a specialist area to focus on. Thanks heaps for talking with me! We may catch up with later on in the year to see how she’s going. Next month coincides with the Good Friday Foundations Royal Children’s Hospital Appeal, a charity which I am in my 23rd year of collecting for. As a result we will be looking at an overview of clinical presentations of young athletes including Sever’s and Verruca.